Coming off the numerous accolades for his sinister score for Hereditary this past spring, avant-garde composer Colin Stetson brings his boundary-pushing scoring talents to the upcoming series The First, which debuted in September on Hulu. Starring Sean Penn, LisaGay Hamilton, Natascha McElhone and more, the series chronicles a crew of astronauts as they battle peril and personal sacrifice as they race to become the first humans on Mars. Stetson's otherworldly, organic approach provides an active backdrop that is something of a character of its own throughout. Check out the trailer on YouTube, laced with Stetson's music. "The End," the initial track taken from the score, is streaming today via Soundcloud. The soundtrack is set for release September 28th on New Deal/Record Collection, with the vinyl edition set for release this winter. New Deal, the new label from Grammy award winning producer Blake Mills, launches with this new score as it's inaugural release. "There’s a total inseparability between his writing and playing; together they conjure something primordial and beyond language," Mills describes. "I remember knowing immediately that I would be a lifer, a devout fan, with a preemptive love for all his music that I hadn’t even heard yet." 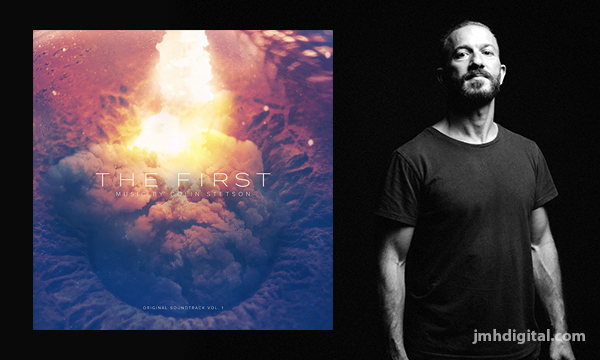 From Colin Stetson: "The music of The First is built on a foundation of stark and intimate qualities as exemplified by much of my solo saxophone repertoire, enhanced and expanded upon in every direction, from the epic orchestral character of horn and low brass fanfare, to the fragility and humanly intimate nature of muted solo piano. The breadth and scope of the overall narrative, comprised of these many real and extremely human stories of ambition, of love, and of grief and loss, has made it possible for me to fully explore such a multitude of aural approaches, resulting in a score which is as sonically and stylistically disparate as the personal stories of each of our characters, woven together by the common thread and themes of this grand shared purpose and of the sacrifices made by all in it’s service." Stetson is equally at home in the avant jazz tradition of players who have pushed the boundaries of the instrument through circular breathing, embouchure, etc. (i.e. Evan Parker, Mats Gustafsson) and at the nexus of noise/drone/minimalist music that encompasses genres like dark metal, post-rock and contemporary electronics (i.e. Tim Hecker, Ben Frost – both of whom have mixed or remixed Stetson recordings). "Colin Stetson was the first decision made when we began putting together the team for The First," explains Executive Producer Jordan Tappis. "There was no debate. His prodigious creative spirit aligned perfectly, in tone and substance, with the world we were beginning to build for our inaugural season. Colin's resulting score plays as significant a role as any other creative element in the series."